Consumers expect more from CSR and want the role of companies in society to benefit social and environmental issues rather than create them. So states the 2013 Cone Communications/Echo Global CSR Study, which reflects on the sentiments of more than 10,000 citizens in 10 of the largest countries in the world by GDP. The report finds that there has been a significant shift in beliefs about the role of business in society; companies are expected to be active participants in creating positive change in terms of social and environmental issues. Furthermore, the study finds that consumers want companies to engage in CSR and create real and meaningful impact. 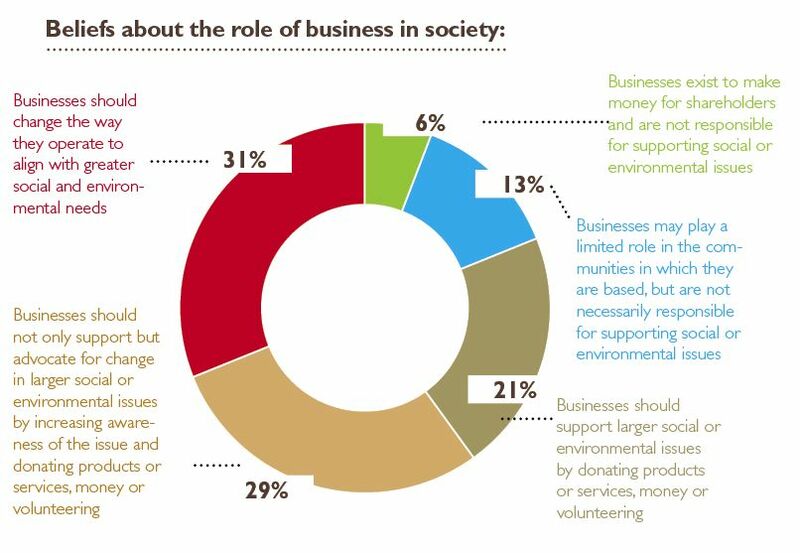 31 per cent of people believe businesses should change the way they operate to align with greater social environmental needsand 29 per cent believe business should not only support but advocate for change in larger social or environmental issues by increasing awareness of the issue and donating products or services, money or volunteering (above left). The study also found that 93 per cent “want to see more of the products, services and retailers they use support worthy social and/or environmental issues”. It seems from this year’s findings on CSR that customers are more concerned with honesty and want to know what companies are doing to improve environmental and social issues. There is a call for transparency in business and the ability to access more information about the environmental and social impact of the businesses they engage with. It also appears that, while the respondents call for businesses to take an active role in creating positive change, they themselves actively seek information and changing their role in the corporate world. 24 per cent of respondents want information about what the company is doing about social and environmental problems on the labels themselves (above right), which is an increase from previous findings from 2011, where only 22 per cent were concerned. Consumers, the survey argues “want to be a part of CSR efforts, and purchasing is largely their opportunity to do so.” These findings may only suggest a small shift, but there is an evident one in the way people want to engage with the company and involve themselves in CSR.